Today I tried the 4 in 1 game that I bought yesterday, at first I put treats in the easy side of the puzzle. For Dita, was this too easy, so I decided to turn the puzzle around, and did a variation. That was for Dita also a bit to easy. I tried to let Vivien and Judy do the puzzle also, it was so funny, they are soo quick, I placed the treats under the most difficult to reach places. Only Scarlett was a bit confused, she doesn't really like this stuff, she always looks at me like, just give me the coockie, why must I go look for it. But with some happy talking we managed it. She puzzled all the coockies out of the puzzle, and she was wagging her tail when I told her she was a good girl. Maybe one day she will think doing a game is fun. What I found of the 4 in 1 game? 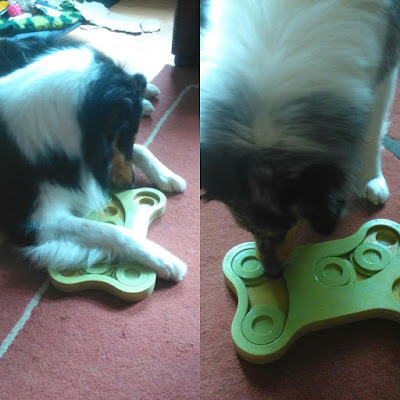 For our dogs it's to easy, but on the other hand my youngsters are just beginners and I didn't give this game to them, so we must try if it is more for them.